Take I-5 south to Exit #271 - Woodburn, Silverton/Hwy 214. Follow Hwy 214 south 30 miles through Woodburn, Mt. Angel and Silverton to Silver Falls State Park. See details below. After taking I-5 Exit #271 (Woodburn Company Stores), take a left at the end of the ramp. Following signs for Hwy 214, cross over freeway, go east 2.5 miles passing a fire station and a Bi Mart store on your right. At the intersection turn right onto Hwy 99 south. Go 1 mile. At the 3rd stoplight (Mini Market on your right) turn left, following Hwy 214 another 8 miles to Mt. Angel and then 3 more miles to Silverton. Follow Hwy 214 through Silverton south 14 miles up into the hills to Silver Falls State Park. Go 1/2 mile past the park entrance sign to North Fork Road (on your left). Turn left, go 1 mile up the gravel road, taking the left fork at the large sign for CRC. Follow banners and signs up the hill to the Main Lodge. 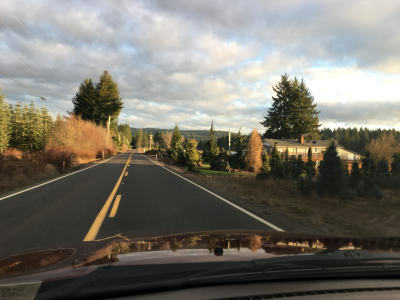 Take I-5 north to Exit #253.Take Hwy 22 east (toward Bend) 7 miles to Exit #7, Silver Falls State Park/Hwy 214 and follow Hwy 214 15 miles to Silver Falls State Park. Passing South Falls, drive 2 more miles, crossing the bridge to the North Falls Parking Area. Take North Fork Road, an immediate sharp right, just beyond the entrance to the parking lot, 1 mile up the gravel. Follow signs and banners to CRC. This is the country route. Take I-205 Exit #10-Park Place, Molalla. Follow Hwy 213 through Mulino and Marquam 30 miles to Silverton. Follow "From Silverton" directions.